Cyntech's range of gorgeous Raspberry Pi cases are compatible with both the Model A Raspberry Pi in addition to the Model B! This compact, low-cost case is tailored to fit the Raspberry Pi board and provides openings for all the connectors including an exit slot in the side of the case allowing a ribbon cable to be fitted to the board’s 26-pin GPIO header. The Cyntech Raspberry Pi case also features a light pipe window for viewing the board’s LED indicators! The case, which is printed with the Raspberry Pi logo, provides an attractive solution for protecting the your Raspberry Pi. 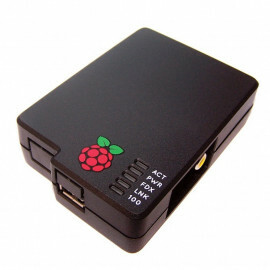 Rugged and extremely good looking; this could just be the best Raspberry Pi case on the market! Please Note. Rubber Feet are Not Included.